The sight that greets you upon warping in (and killing all of the enemies). Living just off the main pipeline to the Eve Gate, I’m used to seeing a certain amount of traffic fly by on a regular basis. Capsuleers making their pilgrimage to the Gate, capsuleers hunting down the pilgrims, research vessels, and a fair amount of Blood Raider activity really round out the area. It is perhaps not the quietest area in game, but for the past few years now I have called it home quite happily. Being in low security space was an added bonus, as I was able to get away from the increasingly worrisome oversight of CONCORD and its many, many regulatory heads. When you add in the bonus of more lucrative loot from exploration than you might find in high security and being able to check in on a number of significant New Eden historical sights on a regular basis, I find that choosing to live in my little corner of New Eden was a smart choice indeed. And while I may have moved on temporarily at different points in time, the area is always there to welcome me home when I’m done with my latest adventure. The classic silhouette of a CONCORD battleship. Some of the stationary defenses can be seen near the gate. When settling into the area, however, I quickly discovered something odd. 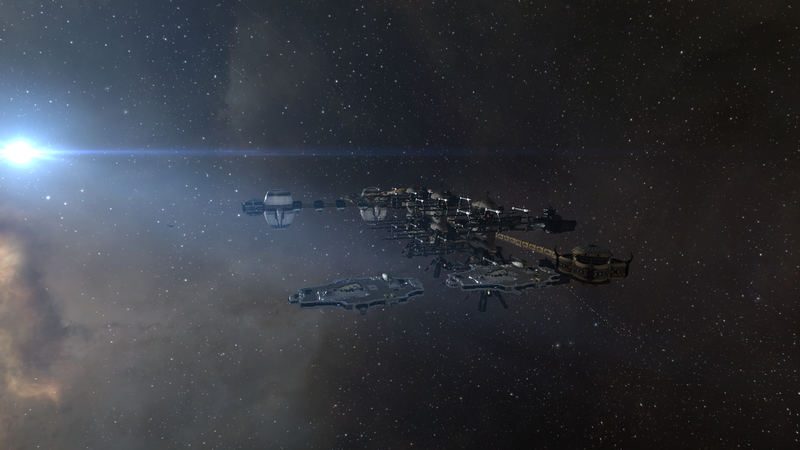 This was shortly after Sansha Kuvakei had started rearing his ugly head in New Eden once again. At the time, CONCORD essentially abdicated defense responsibilities when incursions by the Sansha occurred, preferring instead to coordinate with the empire navies and focus on protecting civilian populations while leaving it to the capsuleers to rid the constellation of Sansha’s space-based presence. I, along with many others, were very vocal at the time, criticizing CONCORD for not taking a more proactive response to the clear threat. However, as time went on, it became clearer that CONCORD was at least gathering significant intelligence on the Nation, and a number of classified reports were eventually leaked, suggesting that CONCORD’s response to the Nation was centered in something called Operation ISHAEKA. This, along with clear evidence that capsuleers were able to handle the Sansha threat, eventually lessened the calls for a coordinated CONCORD response to the incursions beyond what they were already providing. 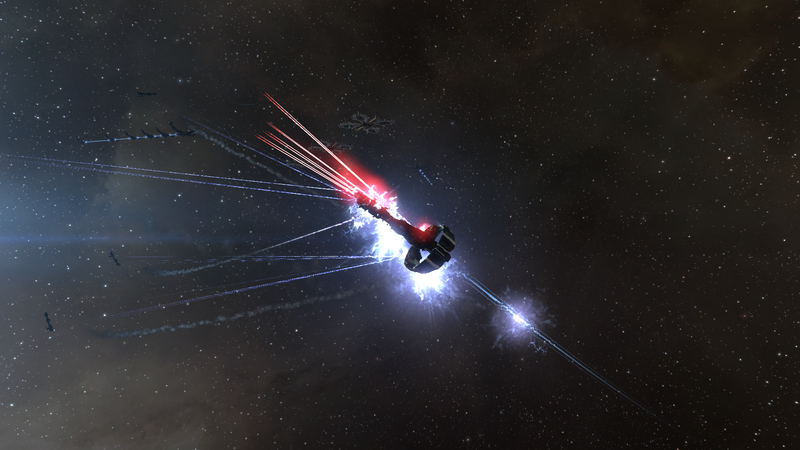 One of my fleet’s ships comes under heavy fire. But back to the story at hand. As I was first settling into my new home, I quickly became aware that there was a heavier CONCORD presence than I would normally encounter in low security space. Generally, low security space should be beyond the reach of the Directive Enforcement Division, the part of CONCORD that most directly interacts with capsuleers (not to mention the part of CONCORD that seems to have the most anger issues…), but there was a suspiciously high amount of CONCORD activity throughout my local constellation, Monalaz. 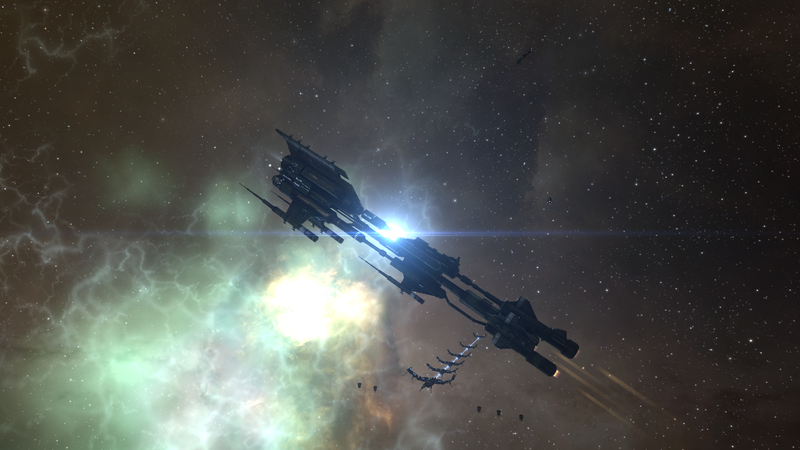 They didn’t seem to act like the CONCORD fleets in high security space, reacting to capsuleer aggression and the like, but they were there nonetheless. Within a few weeks, I discovered that Operation ISHAEKA was more than just intelligence gathering when my probes managed to dig up the ISHAEKA Tactical Headquarters. The CONCORD battleships under heavy fire. CONCORD is not having a good day. The drone buzzes past the staging area in the Haven. Thankfully, CONCORD didn’t seem willing to attack our pods. Although we couldn’t progress past the second area, we were able to see the sizeable fleet that had so quickly and effectively destroyed us. The fleet’s core was a set of 16 battleships who locked us almost immediately upon warp-in, screened by lighter forces of frigates, cruisers, and battlecruisers. Clearly, something was here that CONCORD wanted to protect. Unfortunately, at the time I was not quite in a position to replace my losses. My interest drifted to other, more accessible locations and despite the fact that I still lived in Monalaz, I quickly stopped giving the Headquarters much more than a second glance as I saw what else the Cluster had to offer. A closer view of the landing pads and logistical centers. That is, until a few weeks ago. For what should be obvious reasons, I have been on pretty friendly terms with the Evesploratory Society, a group dedicated to exploration. 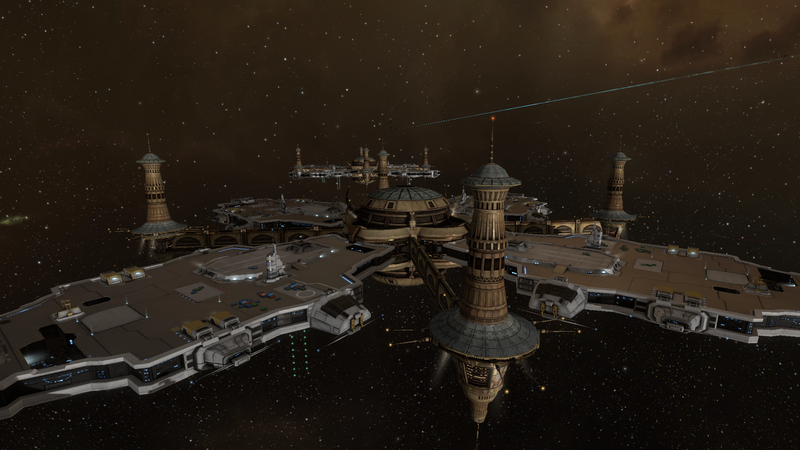 Indeed, the members of the Society were kind enough to name an Astrahus-class citadel after Eve Travel as a tribute to my work (I was admittedly tempted to profile the citadel here but it seemed oddly self-serving to do so, though that hasn’t stopped others from talking about it). In any case, while chatting with members of the Society and some other explorers, the topic of the ISHAEKA Headquarters once again came up. 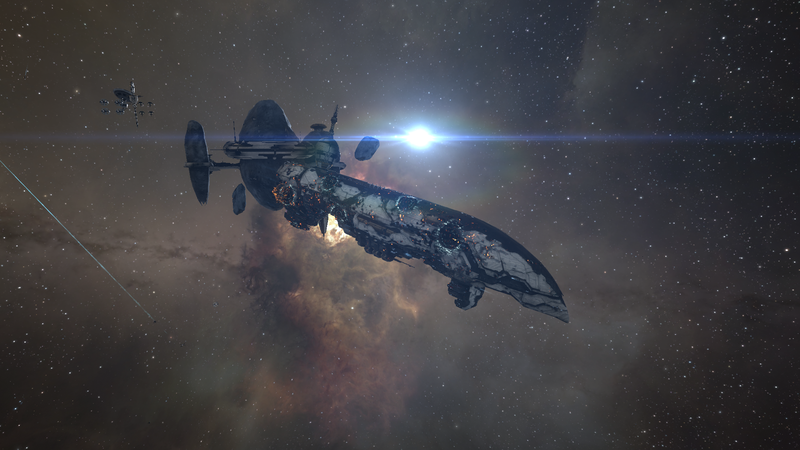 After I explained my prior difficulties getting into the complex, a number of pilots agreed to challenge CONCORD and their Amarr allies yet again. A week or two later, we formed up in a fleet and headed off. Although some of the local pirates decided that our forming fleet was an ideal target, we eventually got in a ragtag fleet consisting mainly (though not entirely) of Stratioses. 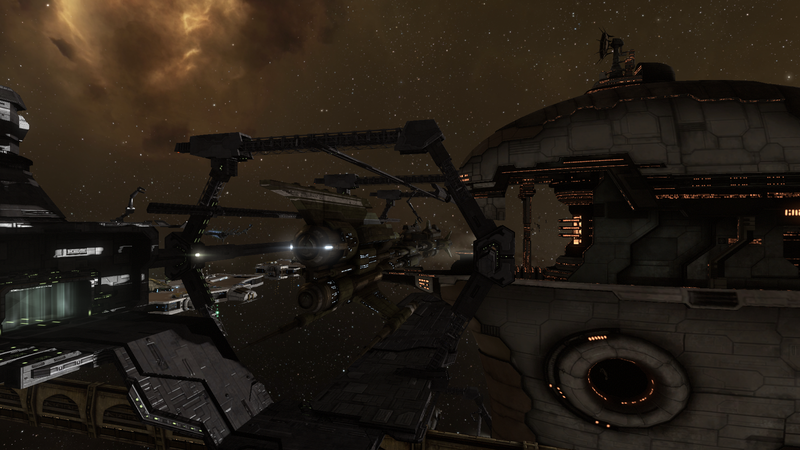 And so we brought the fight to CONCORD and warped in to the ISHAEKA Tactical Response HQ. 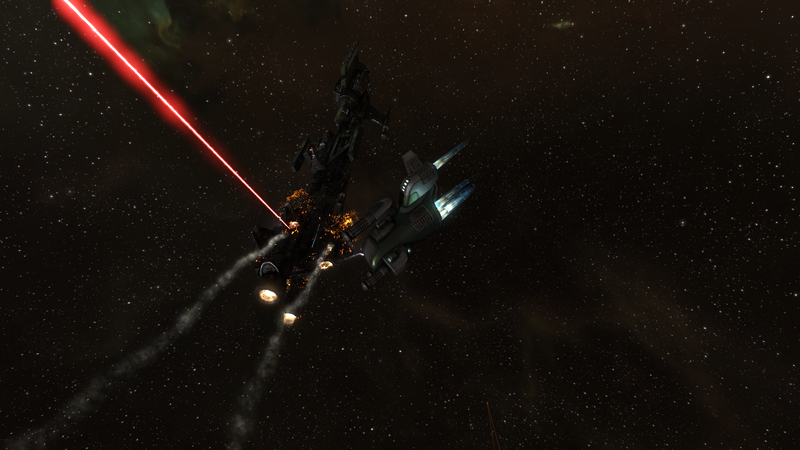 CONCORD under attack in the fleet staging area. As before, the initial area surrounding the warp-in point consisted primarily of heavy fortifications for the rest of the complex. It was clear that CONCORD didn’t want anyone poking around (and we were once again threatened with lethal force if we tried to breach the rest of the complex). However, with the help of my fellow fleetmates, who called themselves the Misfits, we quickly cleaned up the initial fleet, and made our way deeper into the complex. As we worked our way through the defensive forces, it quickly became evident that although the forces were formidable, they apparently did not have authorization to utilize the classic anti-capsuleer technology that capsuleers rightly fear. Instead, the CONCORD forces appeared to be restricted to classical weapons. After the fighting had finished, I was able to pause and examine our surroundings a little more closely. The initial area was fairly bare beyond the defensive fortifications, as you might expect. On the other side of the area from the warp-in point, an acceleration gate led deeper into the complex. With some amount of trepidation given my prior history, we activated the gate and were flung deeper in. We are under heavy attack! 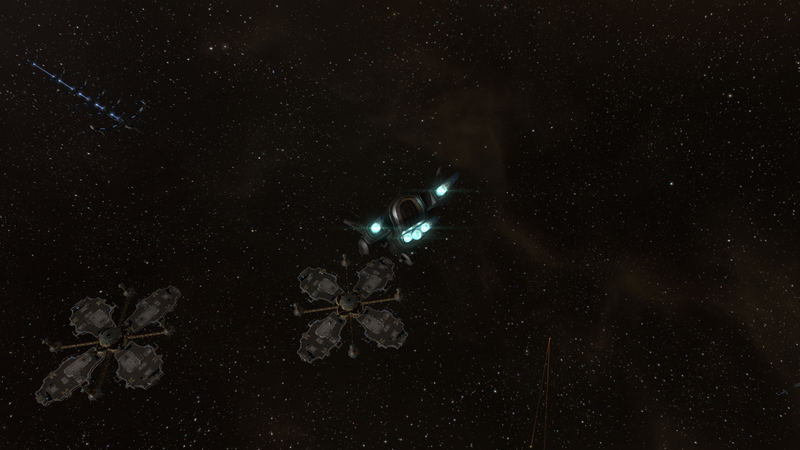 Capsuleers are breaching our staging area! All local files are to be transferred immediately from the archives to a secure location offsite. Initiate burn protocols for all hard data. 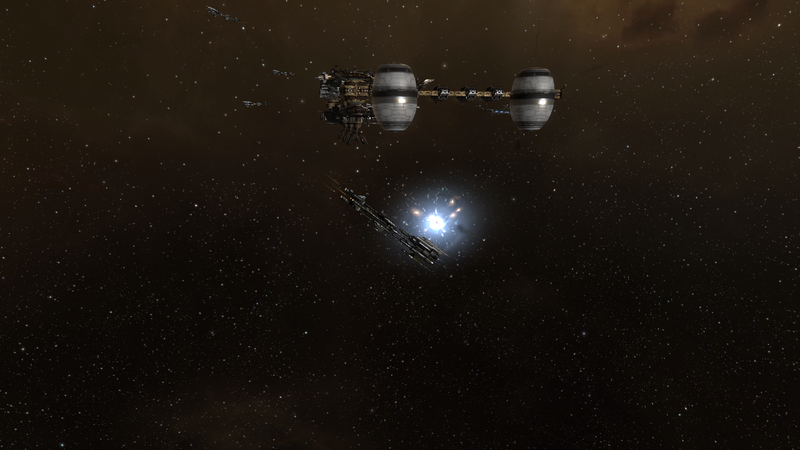 DED forces will delay the capsuleer incursion at the staging area until we can secure all intelligence. Give ’em hell! 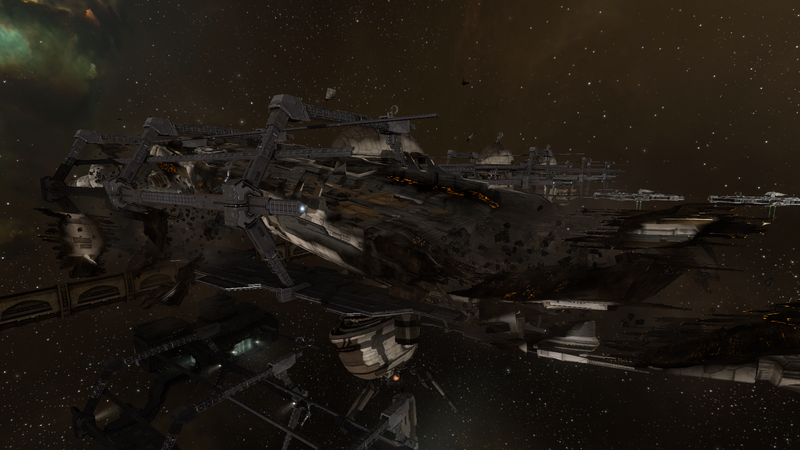 The wreckage of an Archon-class carrier. Once again, our ragtag fleet was met with heavy resistance. While there were 5 fewer battleships waiting for us, those missing battleships were more than made up for by the 20 smaller ships flitting between the battleship behemoths. But once again, our fleet kept its collective cool and we calmly worked our way through the various vessels. I only hoped we were giving the CONCORD crews enough time to evacuate their vessels: I only wanted to see what CONCORD had hiding here, I had no desire to cause mass destruction unless absolutely necessary. Eventually, however, all that was surrounding us were cooling wrecks and I had a chance to examine the area once again. As a fleet staging area, I was not surprised to find a large array of shipyards waiting for us, along with quite a few landing pads filled with freighters in various states of loading and unloading. 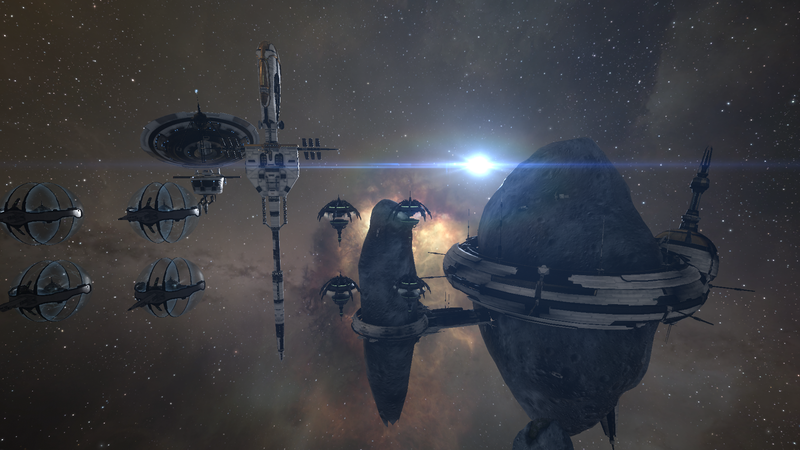 Most of the drydocks were empty, but a few held various CONCORD or Amarr ships nearing the end of construction. Surprisingly, one of the drydocks also held the shattered remains of an Archon-class carrier that had clearly undergone heavy fire. Why had they bothered dragging it back to the shipyard for analysis? Perhaps it had been damaged by Sansha forces and they were studying it for purposes of developing countermeasures. It was at this point that I was startled to realize that I had seen few, if any, indications that the forces here were in fact organized to fight Sansha’s Nation. Indeed, I had seen few indications at all of any relation to Sansha. This struck me as very odd. The information you have come for is gone. All that awaits you now is the cleansing light of Amarrian laser fire! All pilots engage! Not exactly the welcome I was hoping for. 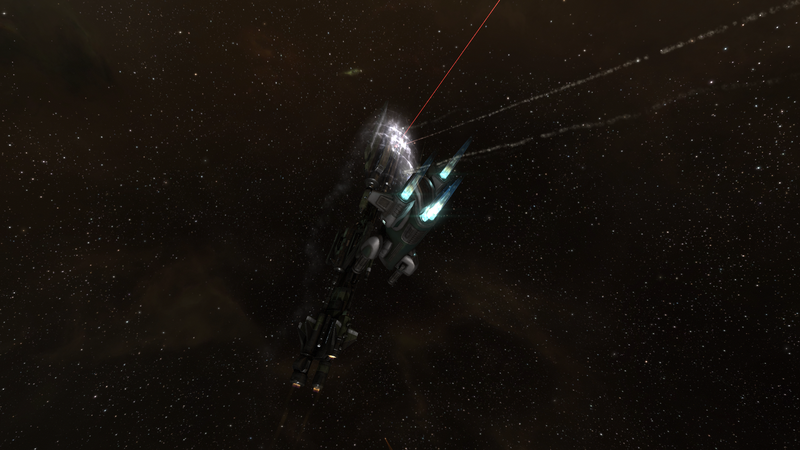 But we were quickly once again fighting for our lives against a combined CONCORD and Amarr onslaught. But we once again managed to prevail through sheer force of will (and the timely arrival of two logistics ships to help us repair). As soon as we were once again surrounded by cooling wreckage, I took a look at this last area of space. Clearly, this was the central administrative area of the complex. A large, though now abandoned, station formed the backdrop of the area, while a multitude of communications and other equipment could be found arrayed nearby. A quick scan confirmed that there was no information salvageable; the CONCORD technicians had done their job quickly but thoroughly. The structures in the Archive area. As the rest of the fleet celebrated their conquest and rare victory over CONCORD, I couldn’t help but notice that once again, CONCORD was raising more questions than answers. Absolutely no reference was found to Sansha or combating the scourge of his forces throughout the cluster. What, then, is Project ISHAEKA actually concerned with? Their last message to us especially made it clear that they clearly thought we were after specific information. What were they afraid we’d find? What could force CONCORD to enact such drastic measures? I couldn’t help but feel that, as usual, if CONCORD were just more open with the capsuleer community, more willing to treat us as equals rather than rabid animals to be contained, we’d be able to help CONCORD achieve whatever goals they had… assuming it wasn’t something directed against us. A view of the triumphant fleet. Whatever unanswered questions I had, however, certainly weren’t going to be answered that night. Those were worries for another day. Instead, I chose to revel in the feeling of finally overcoming something that had mystified me for years, and to do so with a group of good friends. Although we left a trail of destruction in our wake (and it is rare indeed that a group of capsuleers leaves behind anything else), successfully completing our mission in a group of friends is a feeling that can’t easily be described or replicated. As I set a course back for home, I felt happy that after five long years, I had finally met the neighbors. Potential Hazards: Monalaz is an entirely low sec constellation. 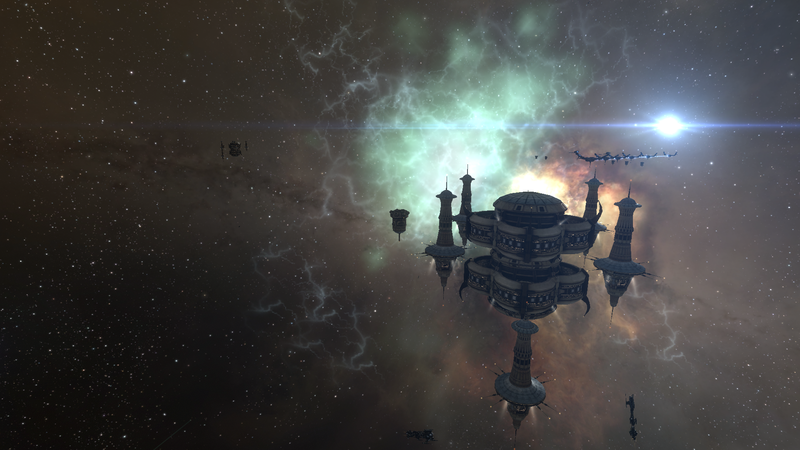 Pirates and gate camps, especially when flying in from Amarr, are common, and caution is advised. Additionally, the rats are quite difficult in the site and heavy resistance is to be expected. Soloing the complex is not recommended, though you can see that we completed the site without too much difficulty with a number of smaller ships. Additional Notes: The Tactical Response HQ should almost always exist somewhere in Monalaz, though I did not confirm if the site respawns immediately after completion or whether you must wait until downtime before finding it again. It is listed as a combat site, and you do need probes to scan it down. This entry was posted on October 20, 2016 by mark726. It was filed under Low Sec Sights and was tagged with Genesis.